artificial flavours or colours. Fits standard lick holder. The ideal stable boredom aid for horses. Available in 3 mouth watering flavours: Cool carrot, Perfect peppermint and Adorable apple. 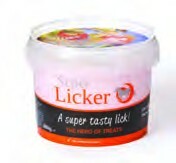 There are currently no questions for SuperLicker - be the first to ask one!